The American Association of Orthodontics recommends initial orthodontic consultation to be done at age 7, generally the first adult molars begin to come in around age 6. While it is never too late to start, early evaluation can be important. This evaluation is not always followed immediately by treatment, often if orthodontic work will be needed children’s growth will be monitored until it is time to begin treatment. Early treatment is not always necessary, and sometimes treatment does not being until all baby teeth have been lost, and all adult teeth are present. However, some conditions are much easier to treat when the palate is soft and natural growth aids the process. This is a condition in which the upper teeth bite down inside the lower teeth. An expander can be used to treat this, which slowly and painlessly widens the upper jaw creating space for the teeth to bite correctly. It is easiest to do before the jaw is fully developed. Waiting too long with a crossbite can result in oral surgery. When the jaws are too small, the permanent teeth crowd, crossing over each other. The expander may be used here as well (and in some cases tooth extraction) to help permanent teeth emerge correctly. If Braces are required later on, the length of treatment will most likely be shorter and less complicated after expansion. When front teeth protrude, they are more likely to be chipped or fractured. They can also impact a developing child’s self esteem. Appliances can be used to correct this, and can avoid surgery in the future. Developing bad habits is a normal part of development, some of these habits however can be detrimental to a developing child’s health and have poor influence on development of teeth and jaw. 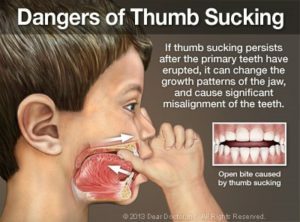 This includes thumb sucking, tongue thrusting, and mouth breathing. Mouth breathing is considered abnormal when the mouth always remains open. It can cause abnormal growth of the jaws that can lead to serious orthodontic problems. There are many treatments available to correct these habits- the sooner they are taken care of, the less damage is caused by them. Sometimes they are not as easily recognizable as above, and that is why it is important to have a professional opinion early on.